﻿ Gary Ewan Park - What is going on with WP Discovery? WP Discovery - Is it all a scam? I am happy to wait and see - but I've seen no evidence to suggest it's NOT fake. It all seems like an attempt to gain a large number of followers, to try to earn money. 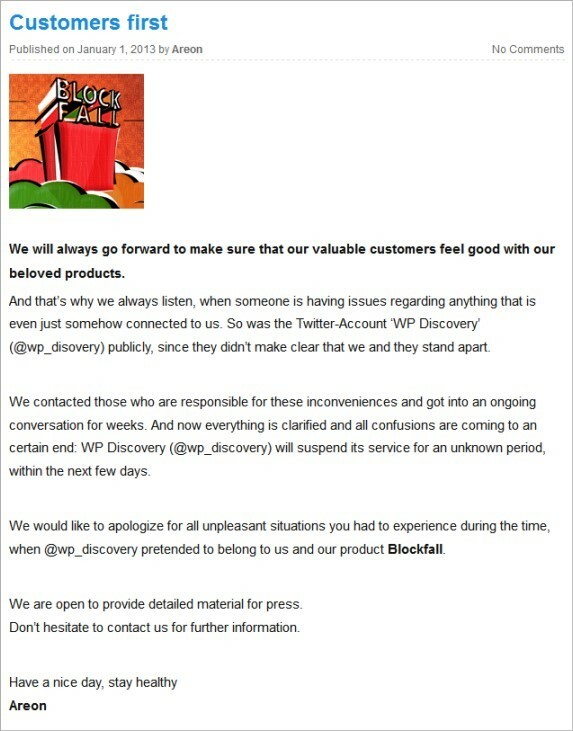 The WP Discovery Twitter account has now been closed as a result of legal action between Blockfall and WP Discovery. 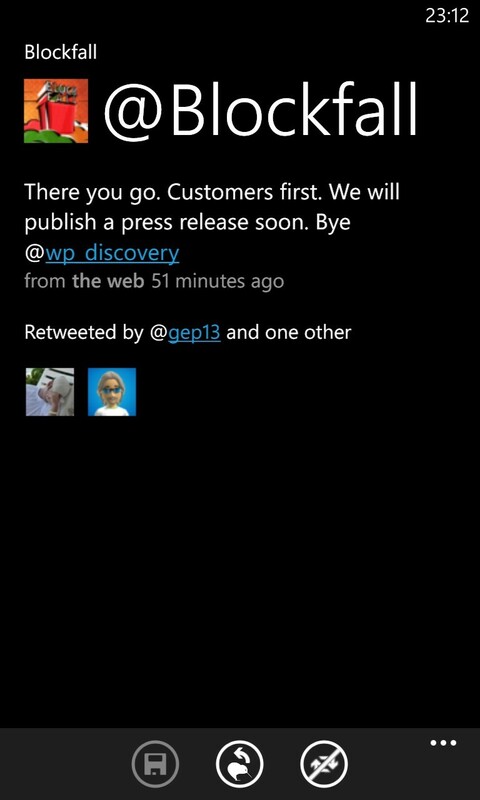 This was WP Discovery's last tweet on the subject before their account was closed. So to me, it looks as though it was all a scam, and to the best of my knowledge, no Nokia Lumia's, or Surfaces, or anything else, was given away by WP Discovery. 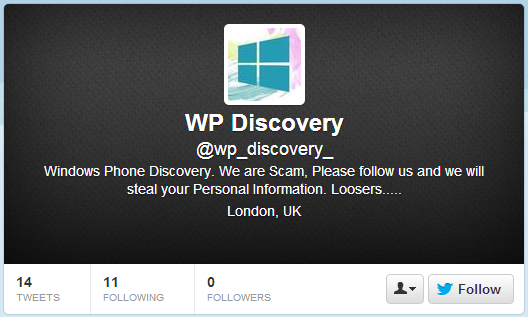 In case you haven't been following what is going on over on Twitter, there is a growing concern that the Twitter Account for WP Discovery (@wp_discovery) is a scam. For the last few days, perhaps as long as a week, they have been tweeting that they have various pieces of technology to give away. Including things like Windows Surface RT's, Nokia Lumia 920's, and HTC 8x's, as well as other devices. All you have to do is follow them, and retweet their tweets, and you are in with a chance to win. This type of competition on Twitter is not new, and I have been involved in several of them. I even got a free Office 365 t-shirt from one of them. 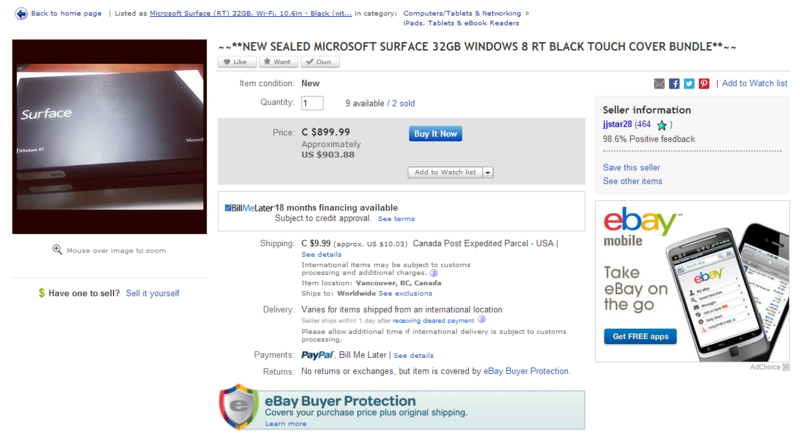 is exactly the same as the Surfaces that are being sold in this eBay auction. 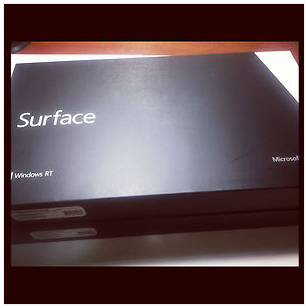 Now, you could argue that both decided to use the same picture, but surely, if you had a Surface to give away, right in front of you, you would take a picture of the actual devices, right? WP Discovery later suggested that this is where they had purchased the Surfaces that they were going to be giving away, that is why the pictures were the same. Please reply in 2min. Since our script runs by itself to choose another winner instead. It's your Surface man! Now, I don't know about you, but I don't spend every waking minute on Twitter, and notifications from the Windows Phone application that I use takes a while to come through, so needless to say, I wasn't able to reply within 2 minutes. I am not sure that anyone would be able to. Now, you could argue that this was just my bad luck, and good luck to the next guy, but if this were a legitimate competition then surely the DM that I sent back in response would have been answered. However, it has now been over 6 hours since I DM'ed them, and I have not had any response from them. you have to wonder what is going on. If there were just some more visibility about what is going on, and what the "rules" of the giveaway are, then I think that a lot more people would be willing to believe that this is on the "up and up". 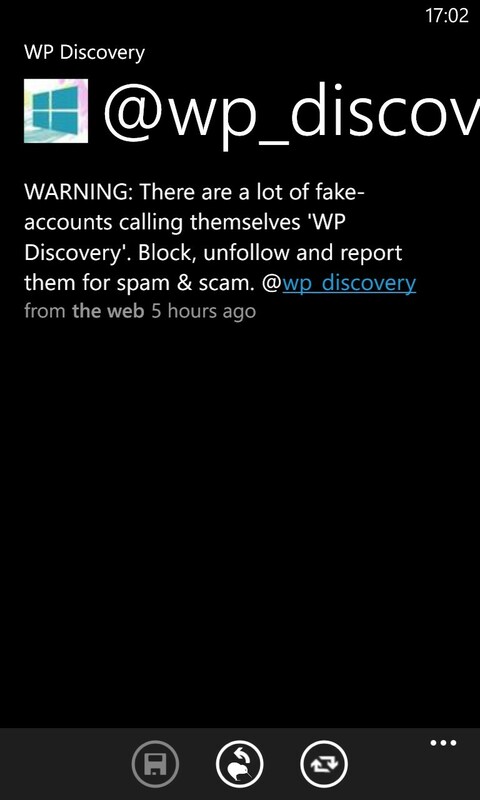 And of course, you can also block and mark the WP Discovery account. This will raise the problem with Twitter themselves, and push them to investigate the problem. Also, take a look at this blog post from Craig Murphy, it has some tips on what to look for if something sounds to good to be true! Just read a great article on Unleash The Phones about why WP Discovery exhibit all the traits of a scam giveaway. Check it out here. Also, remember to check out the comments below for some interesting addendum's from the guys at WP Discovery. Since writing this blog post, I have been contacted by both WP Discovery, and by Areon Development, the company behind the BlockFall game ( a game that WP Discovery seemed to be promoting). They would like to make it clear that they are in no way connected to WP Discovery, and any promoting of Blockfall done by WP Discovery was done without the knowledge of Areon. Areon Development have just posted a new blog onto their site, which you can find here. It reiterates that they are completely independent. Seems like last night was a busy night for WP Discovery. They decided to ask all of their followers to ask them any questions that they might have about the competition. This led to a number of questions about how it all works, what's involved, etc. WP Discovery seemed to try to answer all of these questions (including some from me) and their answers didn't do anything to alleviate my concerns. Some of their responses, and actions, were nothing if not outright rude. 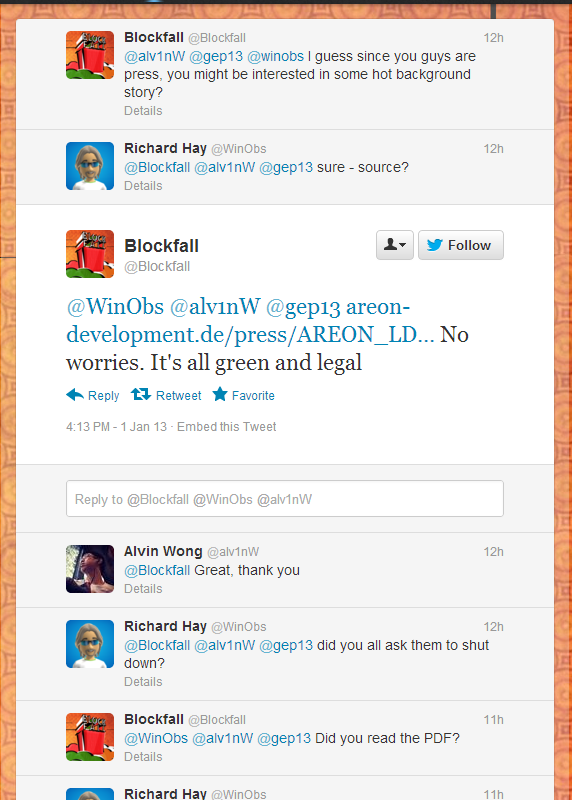 I have begun capturing some screenshots of these conversations, as WP Discovery have a habit of deleting tweets. If you have any screenshots that you would like to add to this gallery, then feel free to get in touch. As requested in the comments below, you will see a screenshot of the DM's that I received from WP Discovery. This was actually quite hard to find. They no longer exist on the Twitter Website when I log in. I can only assume that this is a result of WP Discovery blocking me, or something like this. Lucky, I had them on my phone, which has a local cache of all the items that I have downloaded. 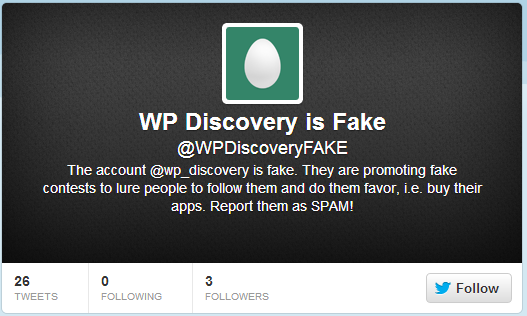 Looks like a new Twitter account has been created called WP Discovery is Fake, you can find it here. For the record, I had nothing to do with setting up this account. Thanks to Jesse Leskinen (@jessenic), I have just been given some screenshots to a DM exchange between him and WP Discovery. This exchange shows Jesse actually winning the prize, but then WP Discovery backing out. Check out these screenshots in the gallery below. This is looking more and more like a scam. Let me know what you think. 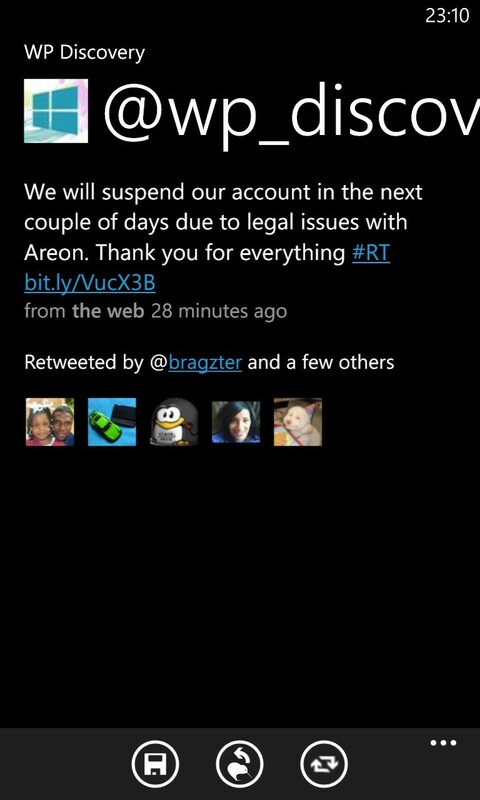 Thanks to Miguel Avila (@iMusice) we have another DM conversation where WP Discovery have backed out of giving prizes. Keep them coming! The more evidence that can be collected the better. 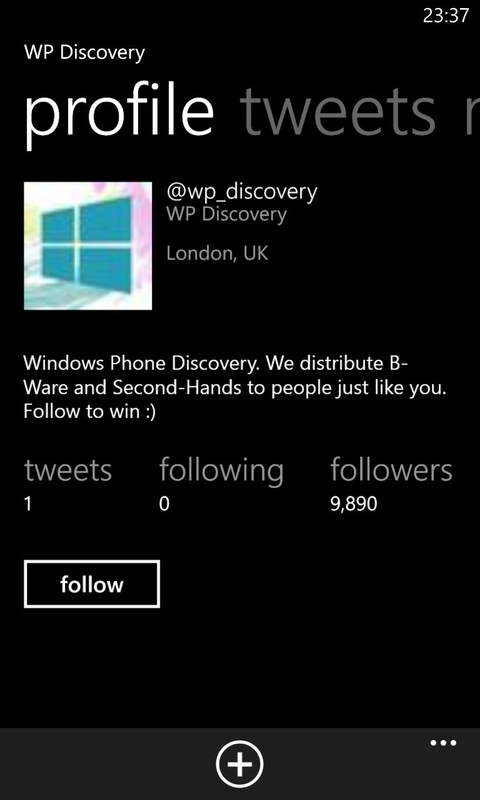 Looks like there is now another "parody" account for WP Discovery been created. 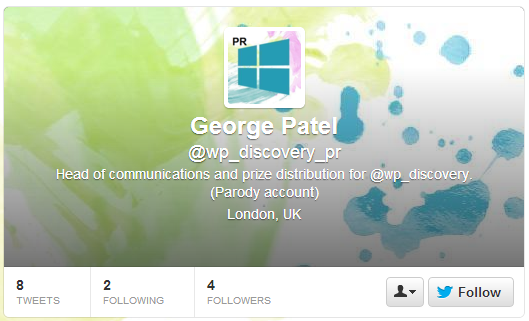 This time in the form of George Patel (@wp_discovery_pr). The profile image and logo for the account are very similar to those of WP Discovery, but it does clearly say in the profile for the account that it is a parody account. I have just added another screenshot which confirms that WP Discovery were in fact following Jenna Kelly, which is something that they out right denied. If nothing else, this proves that they are not honest. Yet another screenshot added, this time from Jeff Dunn (@Jeff_Dunn). More evidence of WP Discovery trying to gather positive ratings and feedback for applications in the Marketplace. Seems like another spoof account of WP Discovery has now popped up, this time in the form of WP Discovery (@wp_discovery_), notice the extra underscore at the end of the name. They have clearly identified themselves as a "parody" account, but just be careful, as looking at their feed, they seem to be taking the "mick" but some comments are dubious. I would personally advise that you stay away from this account. Again, for the record, I had nothing to do with setting up this account. I have added some links that I have seen in both the comments below, and on Twitter to where you can get help if you have inadvertently given out your personal information. If anyone knows of additional sites to give to people, let me know and I will get them added to the main body of the blog post. Looks like more people are becoming aware of this issue. Kimberly, over at StopMalvertising at written an excellent blog post of this topic. You can find it here. I have also added this to the list of bloggers in the main blog post. I would strongly recommend that you add StopMalvertising to your RSS Feed Reader of choice, lots of interesting information there! WP Discovery decided that they should take it upon themselves to warm people about the "other" fake accounts associated with WP Discovery. I laughed out loud (lol'ed for all you cool kids) when I first saw this! NOTE: This screenshot was taken on Tuesday 1st January at the time shown in the screenshot, 17:02 GMT. Changes seem to be afoot.. Craig Murphy (@CAMURPHY) has noticed that WP Discovery are starting to delete all the tweets from their time line. As a result, I have had to update the text in the main blog post, as I had some links to tweets that no longer exist. 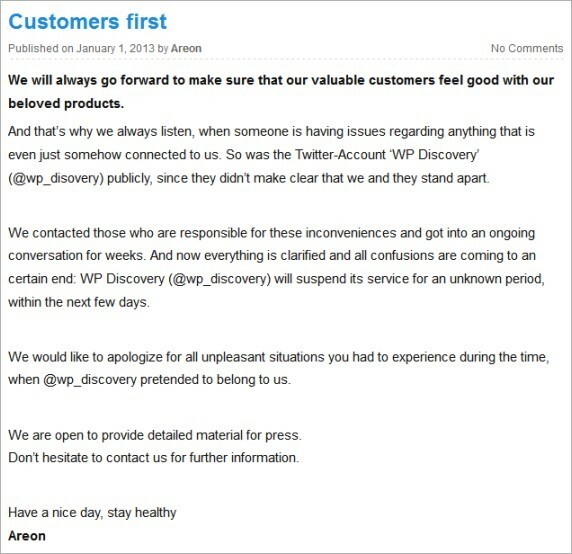 After deleting all the tweets from their timeline, WP Discovery then left a single tweet on their timeline. This Tweet changed after about 30 minutes though. What is shown below are the two different tweets. I have created a Twitter List of all the accounts that seemed to be caught up in the WP Discovery Incident. NOTE: Some of these will be innocent by-standers in what WP Discovery were up to, but I have included all the ones that I was made aware of. You can find this list here. If I have missed anyone, then please get in touch. NOTE: These screenshots were taken on Tuesday 1st January at the time shown in the screenshot, 23:12 GMT. Craig Murphy (@CAMURPHY) has written an excellent blog post on the subject of WP Discovery, focusing on what has happened, and what you can do to prevent yourself getting caught up in something like this again. I recommend that you take a look at it. You can find it here. Remember, at one point, WP Discovery had over 10000 followers. Within the 12 minutes that elapsed in the screenshots above, WP Discovery also stopped following the 40 people that they had been following. The linked PDF can be found here. 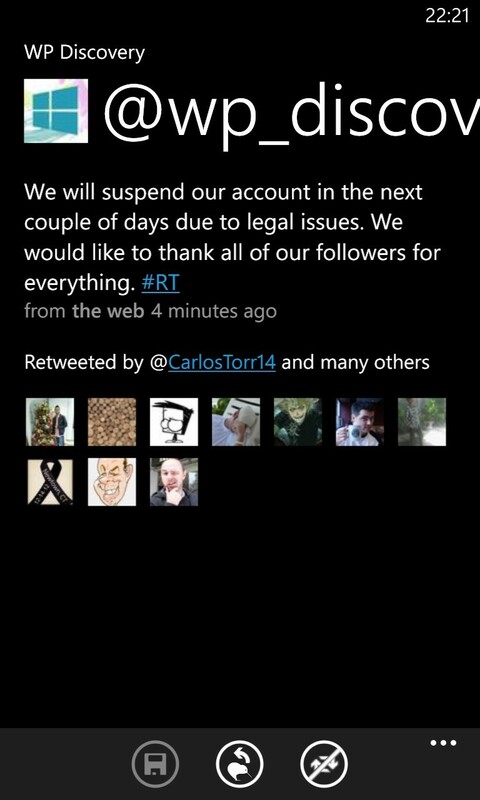 I am VERY happy to announce that the WP Discovery Twitter account has now been closed!